In Nigeria, Selling Men On Birth Control Is An Uphill Battle : Shots - Health News Nigeria's birth rate remain high. Rather than reach out to women, one family planning program is reaching out to men to promote the use of long-term contraception. Although various types of contraceptive methods are available in Nigeria, about 20 percent of women say they're not able to access them. Sometimes their husbands stand in the way. Nigeria is a crowded place — it's the most populous nation in Africa, with about 155 million people. That huge population is a concern, and in the past 20 years, the birth rate has barely changed, according to the country's National Population Commission. Women still give birth to about five kids on average. Although various types of contraceptive methods are available, about 20 percent of Nigerian women say they're not able to access them. What's in their way? Sometimes it's their husbands. 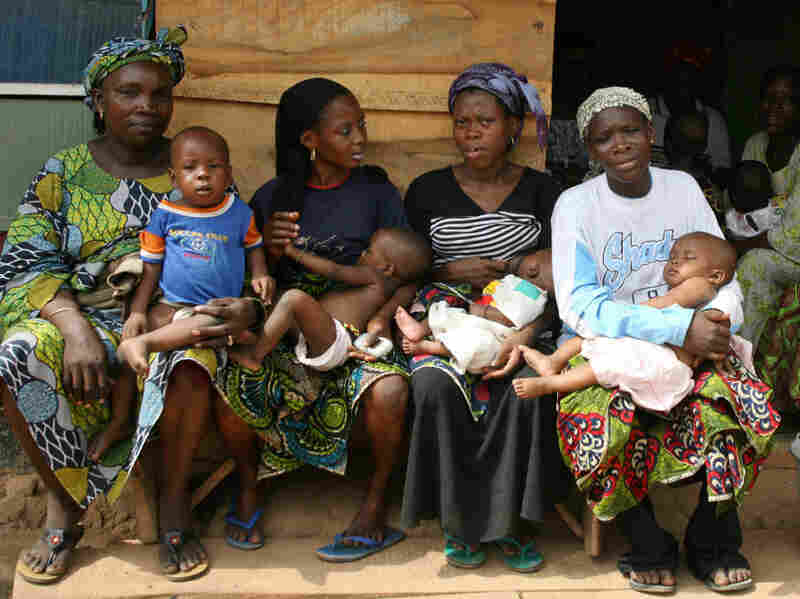 The Society for Family Health, or SFH, an affiliate of the international non-profit PSI, has been trying to promote long-term birth control in Nigeria for six years, such as intrauterine devices or contraceptive implants. It found that women who expressed interest in birth control would go home to tell their husbands about contraception, but they never came back. "That got us thinking, this is tied to the husband," said Dr. Anthony Nwala, senior manager for health and family planning with SFH. So they launched a mass media campaign. Rather than just have women featured on family planning posters around the community, they included men portrayed as caring and supportive. Nwala said the response increased the number of men accompanying their wives to the clinic. "Visual impact was great," he said. "Men felt ownership. The men felt that, "this was about me and my family." SFH also started a peer education model, where they identified men within various communities who were pro-family planning and trained them to educate other men they. Historically, Nigerians were farmers, and as members of a tribe, men had more wives and children to help work the land. But today, a shrinking majority of people are living in rural areas, while the economy has become more urbanized. Providing for a large family in an urban setting is more of an economic burden. But Daniel Smith, associate professor at Brown University, isn't convinced that family planning programs like SFH can influence the way people think about family. "Women are more educated and liberated today, and yet they still want to have five or six children," he said. Smith believes that's partly because Nigerians favor large extended families as a way to stay socially connected. "People still value kinship," he said. "They believe you have a better chance of knowing people by having an extended family network." But Nwala still believes women — and men — are slowly learning that having fewer children will help them economically.